Palestine is a dirty word in Washington and criticizing Israel's policies toward Palestinians is a political taboo. We can talk about Darfur, Nigeria, Sudan, Pakistan, Iran and every Arab country. We can criticize all of them, along with Russia and China, and call for sanctions on human rights violators. But bringing up Israel's atrocities in the West Bank or Gaza is met with denial and disgust, generating millions of disaffected Americans in the process. There is more tolerance in Israel for critiquing the Israeli occupation of the West Bank and Gaza than there is inside the Beltway. America is our home, and Barack Obama is our president. It is our duty to express our disenchantment and to demand change when the leader of our country is wrong. The President must acknowledge that we, the American people, are funding the siege of Gaza. The whole world knows that America is giving political cover for the military occupation of Palestinians. It is time to tell America the truth of our complicity in robbing Palestinians of their human dignity. Terrorism is evil, and we will continue to partner with the President in countering the rhetoric of ideological religious extremism and to end the scourge of terrorism, not for political gain but out of our sacred duty. Now, the President needs to acknowledge that occupation is evil, and it is time he recognizes those engaged in nonviolent resistance against the occupation. They are those who live every day through checkpoints, blockades, home demolitions and expansion of Jewish settlements in the West Bank. Call it an internment camp, a prison - Gaza has become unlivable. The President must also face a reality: Not a single Muslim serves as a senior policy adviser in the White House or as an under secretary in the departments of Justice, Homeland Security, State or Defense. There is no Middle East envoy of Muslim background. The President has yet to name a Muslim as ambassador to any of the 50 Muslim-majority countries. 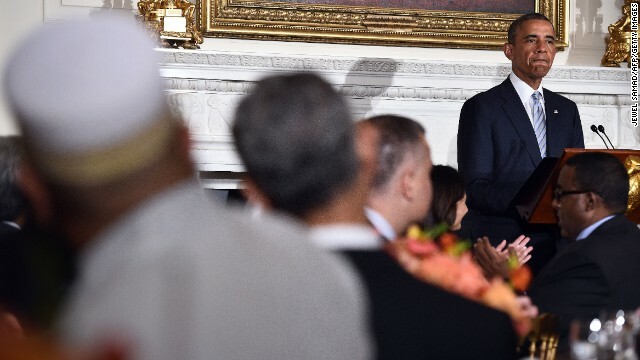 The White House Ramadan dinner cannot be the quota for engagement or enfranchisement. We cannot give Obama a pass because he has said the right things in regard to his respect for Islam, nor can we release him from accountability out of fear of Republicans. Muslims represent 4 million to 6 million Americans and include practically every race and socioeconomic level in the United States. They vote and contribute, and they helped Obama win the presidency. But Obama has gone so far in proving he’s not Muslim that he has excluded Muslims from vital national conversations. We’ll continue to engage his administration to correct this egregious breach of public trust. We demand that he fulfill his promise for change and be the president we voted for. Otherwise, America will be less American. Salam Al-Marayati is president of the Muslim Public Affairs Council. The views expressed in this column belong to Al-Marayati. Next entry »What's wrong with 'Black Jesus'? hey..you brought this up....and now you dont got an answer? August 6, 2014 at 9:37 am"
lmfao: ofcourse i have an answer for your disasociative disorder god, someone with multiple personalities wrote about him. that good enough for you? we went through this i explained that one being can not have three "beings/ personalities" without being seriously messed up in the head. your reply was some BS about how god was one being, but not one being. do you even bother to read what comes out of the dense skull of yours? yes my last reply on the whole three personality god, was my way of saying enjoy your man-made delusion; because that's all it is kermie. your very own fairytale of what you will get when you die; the thing you religious freaks forget is you are sacrificing the life you have now, for the hope of something when you die. kermie: "one God being manifest in three persons does NOT conflict"
regardless of how you try to explain away this blaring flaw; you can't. if one being became three, then you would have GODS, plural. three different beings, not one. if one god has different personalities, then it has a mental disorder...............they make meds for that. you see how that wouldn't work; if three are one, then it is crazy. if it made three selves, then they would be GODS, not god. youre still not using your brain sir...again..one WHAT and three WHOS...that does NOT conflict..it then does NOT become three gods when we say three persons..whats happening is YOU are changing words.....it would not work if we said ONE God manifest into three gods...or ONE person manifest in three persons....yore getting yourself all confused....and again the personality disorder works only on humans, since were are finite and limited, unlike God......youre comparing apples to oranges. the argument you attempt does not work. kermie: ok which of these statements you made from page two are correct? 2) i dont know him personally..I may know ABOUT Obama, but I dont know him personally...same with God. soooooo do you or don't you "personally" know god? you seem to be following the example set in your bible very well; cont rad ict yourself in the same paragraph. kermie: re-read your own words......slowly.
" I came to know OF god PERSONALLY" "i dont know him personally.........same with God." sooo do you know god personally; or don't you? kermie: which of these two statements is more likely true? 2) "He (god) was NOT created..he is ETERNAL." hmmmm seeing we have the equivalent of the total amount of water on the planet worth of information, as opposed to your single molecule worth of "proof of god"..............my money is on energy being the cause of everything; not your lazy "sky-daddy"
kermie: i highly doubt it's irrelevent; it's accually shows that we have more knowledge and evidence for energy; then you will ever have for your or any god. that is why you have faith; we have the scienctific method. you say you know; we truly know. that's why you have tantrums when the only thing you have to fall back on is a single book that was edited, lost, found, revised, interrpted, etc etc etc. enjoy your human made delusion kermie. "....if God had no beginning..then he is nOT created..its a no brainer.."
No brainer, maybe, but certainly this would only make sense to someone choosing not to use their brain. You have no evidence at all that Thos is any different than your god kermit. Both are the products of mens imaginations. You claimed you were leaving, and there was much rejoicing. Why are you back? igaftr: "You claimed you were leaving, and there was much rejoicing. Why are you back?" it just wasn't part of his god's plan to let kermie leave.